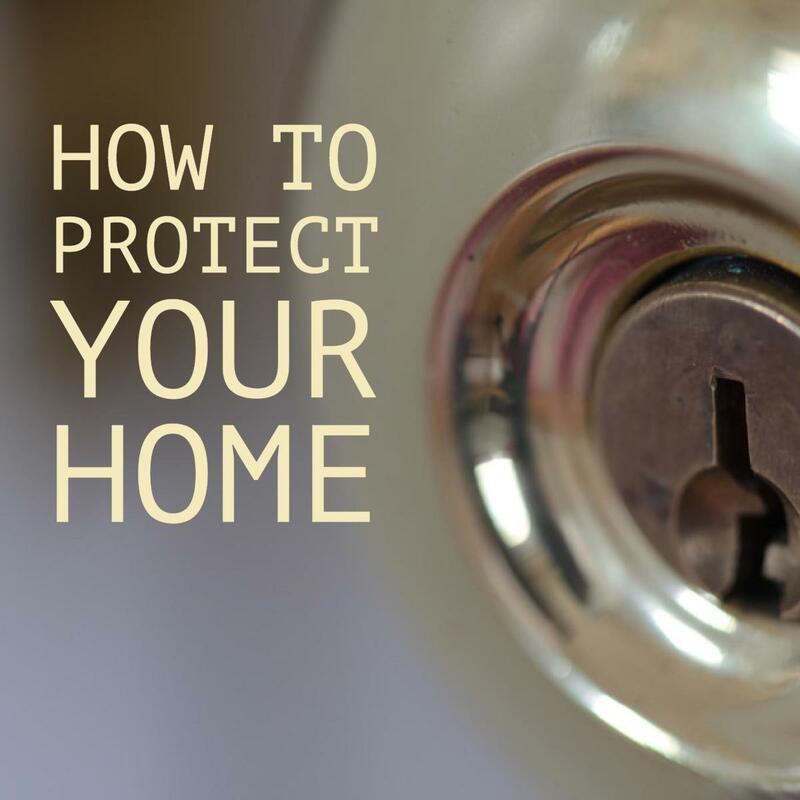 A blaring sounder on a security alarm is both annoying for you and those who live nearby. If you have good neighbors, they may keep an eye out for activity in the vicinity of your home when the alarm sounds. However If false alarms occur regularly, it can be like a scenario from the story "the boy who cried wolf" and they may just ignore it! 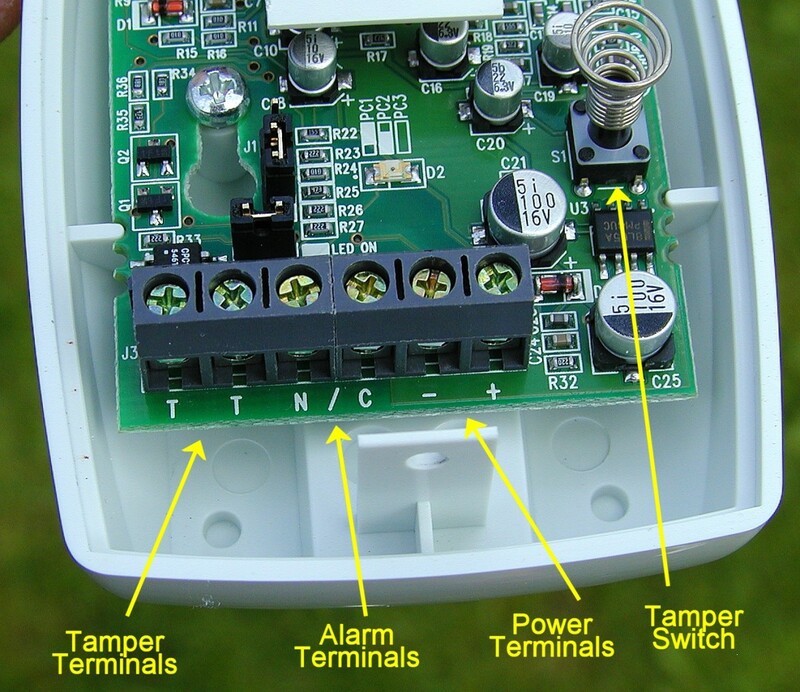 This hub explains the basics of how alarms work and how sensors are wired. It also covers the various faults which occur in sensors resulting in nuisance activation of your alarm. How Does a Burglar Alarm System Work? 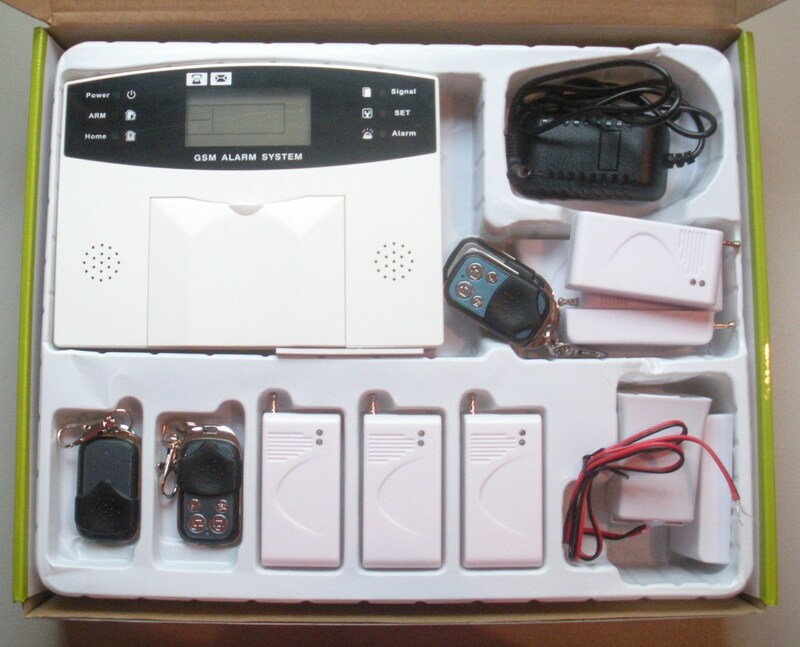 Alarm systems for homes consist of an alarm panel with a display and keypad to which sensors are wired. Alternatively sensors may be wired to a control panel box which is hidden away out of reach of burglars, so that it can't be tampered with. The user then interacts with this box via a keypad mounted on a wall. A microcontroller (which is a type of microprocessor) on the circuit board in the alarm panel runs a software program which scans the sensors regularly. The program will generate an alarm if it thinks a sensor has been activated and an intruder has entered the building. How Burglar Alarm Sensors Work? Sensors are electronic/electrical devices and in the context of security alarms, they either detect entry of an intruder into a building via a window or door, or directly detect the intruders presence. They are small modules which contain microswitches which are normally closed. The switch contacts are normally "volt free". This means that they are isolated from the electronics of the sensor, so that they can be connected to any external voltage source. When a sensor is activated, the microswitch opens and breaks a circuit. The alarm panel detects this and activates an external wall and internal sounder. The panel may autodial a phone number or send an SMS text message to a cell (mobile) phone. Some alarm systems are monitored by an alarm company to which a subscription is paid. Contacts on windows and doors These contain a tiny reed switch enclosed in a small glass tube within the body of the sensor. The switch is kept closed by a nearby magnet. Shock sensors Used for detecting someone attempting to break glass or otherwise using impact force to attempt to gain entry. These may also incorporate magnetic contacts. PIR Sensors These detect the body heat from an intruder as they walk past the sensor. Microwave Sensors Like PIR sensors, they detect intruders but have certain advantages over them. Pressure Mats Detect intruders stepping on a floor. What are the Components of an Alarm System? The alarm panel itself may have a rudimentary display consisting simply of LEDs, or a more fancy LCD display may be provided which gives textual information about the status of the alarm, which zone an alarm occurred in, error codes etc. An alarm panel will also have a keypad for entering passwords and commands. On some systems, wires from sensors are directly connected to the alarm panel. On other systems, the display and keypad module is kept separate from the incoming wiring from the sensors. The advantage of this is that the alarm panel can be smaller and less obtrusive, while the larger junction box with incoming cable, terminals, battery back up etc can be hidden out of view and away from tech savvy burglars who could hack into the system. Several remote auxiliary keypads without displays may also be provided for arming/disarming the alarm in the vicinity of additional exterior doorways. An attempt at entering an alarm code at the panel (if the sensors have been bypassed) will also trigger a "countdown" of the alarm. 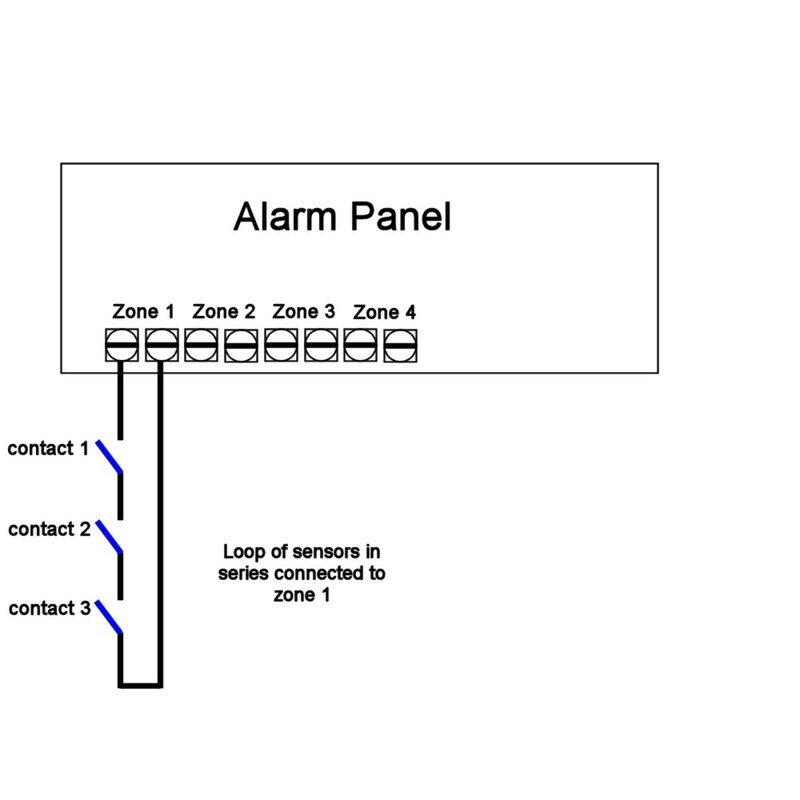 An alarm panel usually has several zones to which sensors are connected. The idea of separate zones is so that when arming the alarm, sections of the installation can be included/excluded from being armed. So for instance, exterior doors could be on zone 1, downstairs windows could be on zone 2, upstairs windows on zone 3, and PIR sensors on zone 4 in a basic setup. When an alarm is armed at night, zone 4 PIRs could be excluded to allow wandering around, and upstairs windows left open by disabling zone 3. When an alarm occurs or cannot be armed (for example due to a window left open), the panel indicates the problem zone. An entry/exit zone is reserved for genuine entry to the building via a doorway. This zone has a delay associated with it before the sounder operates, allowing a password to be entered to disarm the panel. More sophisticated entry alarms for larger buildings will have a greater number of zones and the ability to identify activation of individual sensors, possibly indicating the sensor location on a computer screen mimic, depicting the floor plan of the building. 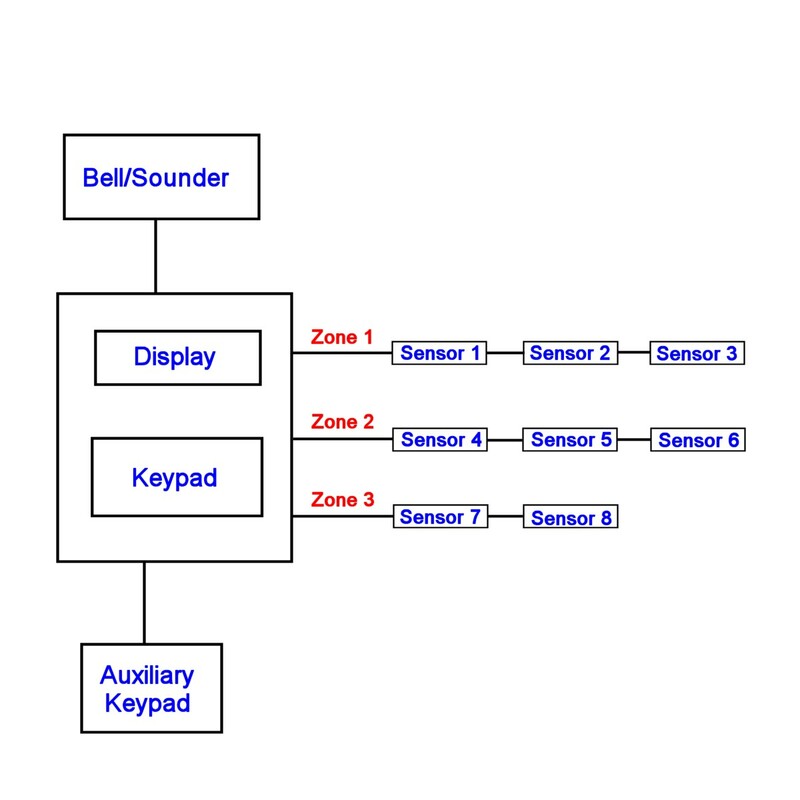 On a wired system, one or more sensors can be connected in series to each zone, known as "daisy-chaining". The disadvantage of daisy-chaining is that if one sensor develops a fault and contacts stay stuck open, the zone has to be omitted during arming, making the other sensors useless until the fault is rectified. A tamper circuit detects an intruder interfering with alarm system wiring even when it is not armed. This is sometimes called a 24 hour circuit. A panic button circuit and panic buttons may be included. When a panic button is pressed, the external sounder activates. Panic buttons can be located near doorways, in bedrooms etc. An alarm panel is usually provided with backup power by a 12 volt lead acid battery. In less expensive systems, nickel metal hydride (NiMh) AA cells may be used. The backup battery maintains power to the alarm panel, sensors and sounder in the event of a power cut or when an intruder cuts the mains power to the panel. An external sounder operates when the alarm is triggered. Older systems used electromechanical bells. Most modern systems use electronic piezoelectric transducers in the sounder. For added security, a sounder may have a backup battery. This allows it to operate even if the cable connecting it to the alarm panel is cut or power to the alarm panel is removed. 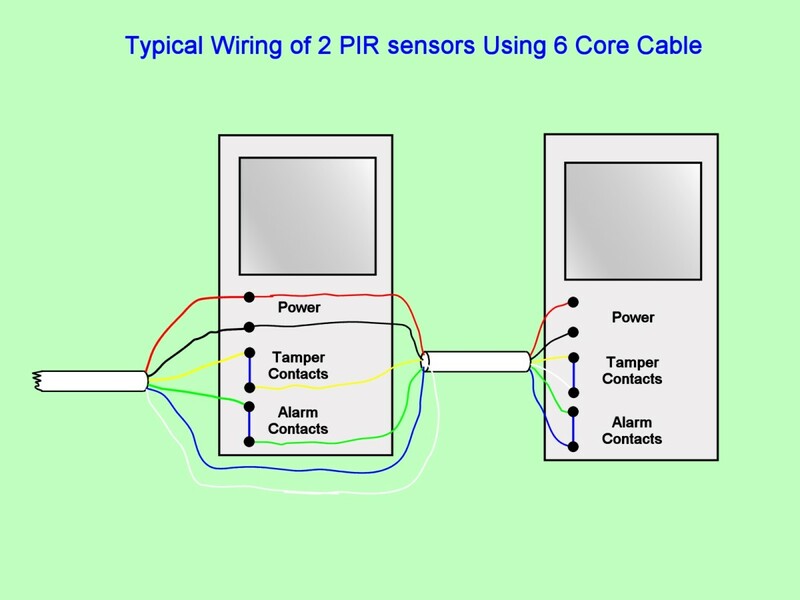 A basic alarm system uses 6 core cable for connection to sensors, 1 pair for power, 1 pair for tamper and 1 pair for the microswitches in sensors which open when the sensor is triggered. Sensors are typically powered by 12 volts DC. If several sensors are used per loop, the microswitches can be wired in series. One core of the cable travels outwards from the alarm panel to all the sensors, and another core of the cable returns to the panel to complete the circuit, similarly for the tamper circuit. A tamper or 24 hr circuit consists of a pair of tamper cores in the alarm cable and momentary tamper switches in sensors, the alarm panel, junction boxes and sounders. These switches are maintained in a closed position by lids/covers on sensors and other components of the system. If anyone removes a lid while the alarm is unarmed, or cuts a cable, (cutting through the pair of tamper wires) a warning sounder will indicate this situation (but the exterior sounder may not activate). If the alarm is armed, the main sounder will activate. Some sensors, e.g. door and window contacts don't have any integrated electronics or tamper switches and so only 2 cores of the alarm cable are required. If all this sounds like gobbledygook have a look at the diagrams below and it should be clearer! Older alarm systems as described above had zone loops which were either closed circuit when no sensors were triggered or went open circuit when a sensor activated. This resulted in a low voltage or high voltage respectively at the control panel. The flaw in this system was that a burglar could short out zone wiring between panel and sensors, effectively bypassing them. Then at a later stage they could attempt a break in. Because the zone was shorted, when a door/window contact opened or a sensor activated, it would be undetected by the control panel. Newer alarm systems are made more secure by adding a resistor, typically about 5k, at the end of the loop. This is known as an end of line (EOL) resistor and adds supervision to the loop by detecting shorted wiring. The panel now has 3 voltages it can possibly measure, high voltage with the loop open (due to a broken/cut wire, or a sensor activating), low voltage if the zone wiring is shorted by a fault/burglar, or an intermediate voltage in a non fault/non triggered scenario. EOL resistors must be fitted at the last sensor in a loop so that the panel can detect when a burglar shorts the two alarm cores in a cable "upstream", that is on the panel side of wiring to sensors. If resistors are fitted in series with the loop at the panel, they cannot detect that this has occurred. Basic alarm systems use 2 cores for sensors, 2 cores for tamper and 2 cores if needed for powering sensors. The problem is that a global tamper is used and this loops through all the zones on the panel. So if a burglar cuts a cable, this deactivates the tamper for all zones and potentially puts the system out of action until the break can be pinpointed. 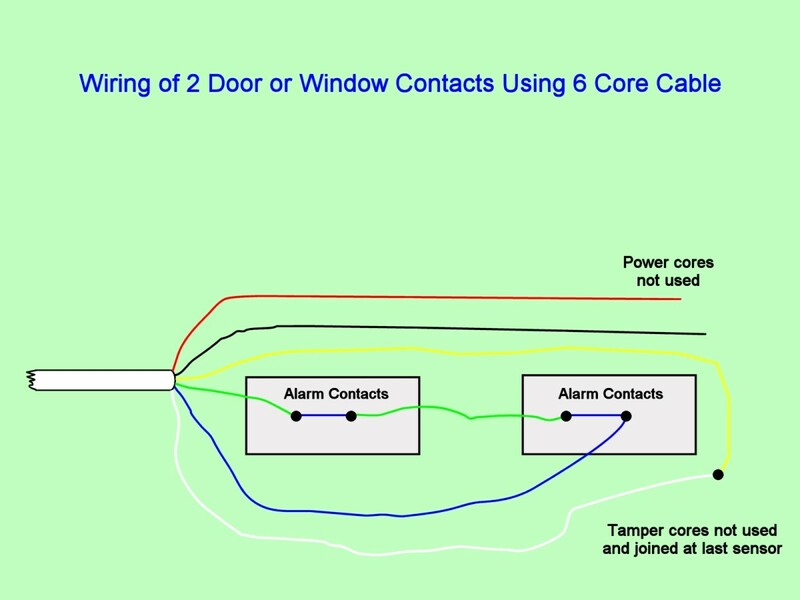 Fully Supervised Loop wiring provides a separate tamper for each zone, so if a cable is cut or a loose connection occurs in the tamper circuit, only that zone will be out of action and also it's easier to trace the fault. An EOL resistor is used at the last detector plus in addition a resistor across the contacts of each sensor in the loop. The system can then differentiate between a no alarm condition, a tamper, or an alarm condition, using just 2 cores of cable for both contacts and tamper. These come as two parts, the contact part and a magnet. The contact part consists of a small plastic module containing a reed switch (a miniature switch enclosed in a thin glass tube) which is mounted on the door jamb or window frame. The magnet part is fixed to the door, or window sash / casement so that it is close to the contact part when the door or window is closed. 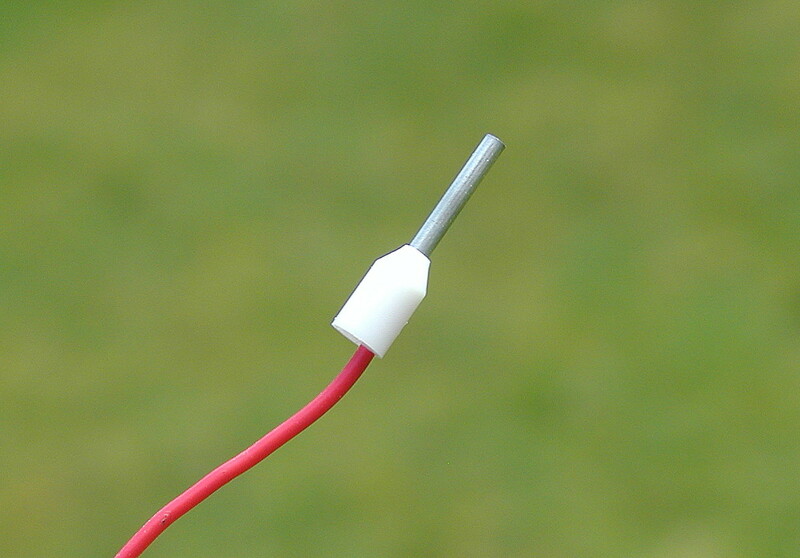 This keeps the reed switch in a closed state. 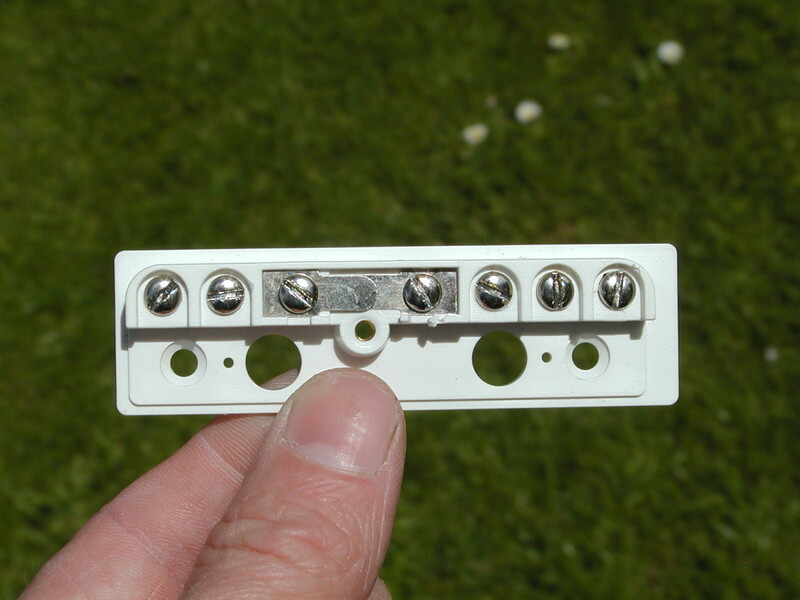 When a window is opened, the magnet moves away from the contact and the reed switch opens. Contacts don't require power and only 2 cores of a cable are required, however if 6 core cable is used, 2 unused cores in the cable can be used for powering sensors added to the system at a later stage. Usually they don't have tamper contacts either, however 2 of the cores can be wired to tamper contacts in junction boxes or sensors, during modifications/upgrade to the system. Shock sensors and magnetic contacts are also available as a combined unit. These sensors use an element sensitive to human body heat. When someone walks in front of the sensor, electronics in the device opens a microswitch which triggers an alarm. PIR sensors have varying ranges and detection profiles over which they are sensitive. Usually they have near, far, and possibly intermediate zones through which an intruder must pass before triggering an alarm. 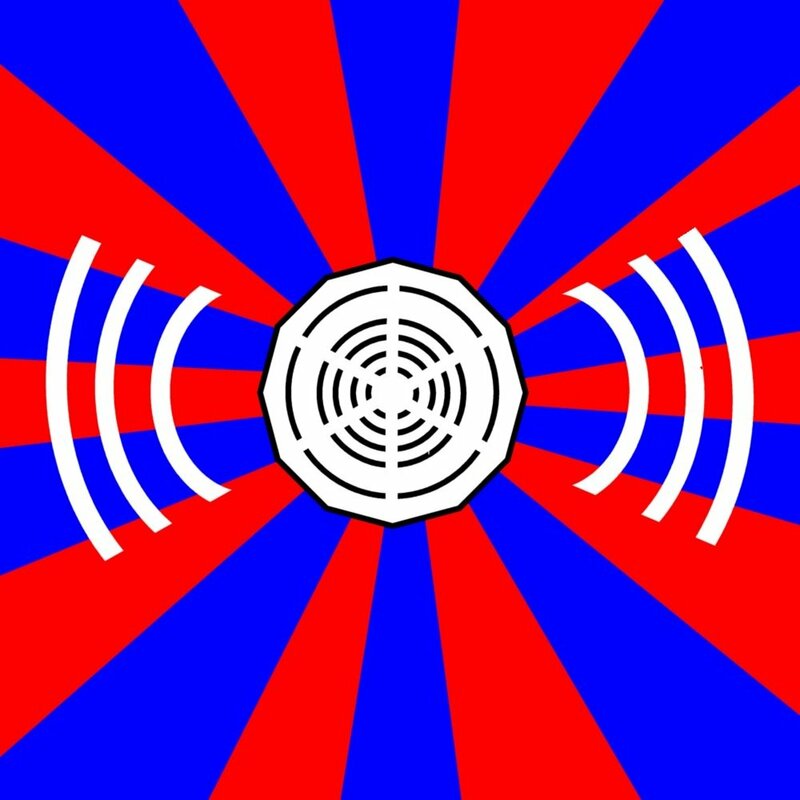 Normally sensors are sensitive over at least a 90 degree sector, but omnidirectional versions are available. Shock sensors are bonded to glass in a door or window or fixed to the frame. During setup, the sensitivity of the sensor can be set and the number of impacts which trigger an alarm. Some sensors are "intelligent" and can detect the sound of breaking glass. Shock and magnetic contact sensors can be combined into one unit. Remember you can use a shorting link at the terminals of the panel if you need to isolate any zones for testing purposes (e.g to test continuity of a loop) or to disable a zone. A short piece of insulated wire is ok. This allows the alarm to be used normally while testing. Alarms are triggered when a normally closed (NC) microswitch in a sensor, or a tamper contact goes open circuit. The resistance of a loop circuit (consisting of sensor contacts and loop wiring all connected in series) must be below an upper limit with all switches closed. This is usually 5 to 10 kilo ohms, but depends on the panel. Also the resistance of the loop when a contact opens has a lower limit, in the range of 100 kilo ohms. To check the resistance of a loop, remove the two wires connected to the zone input at the alarm panel and connect the probes of a digital multimeter, set to the ohms range, to these two wires. Resistance should typically be less than 100 ohms (or around 5k if an EOL resistor is fitted at the last sensor), but can rise if sensors are giving trouble or if you have many sensors connected in series and long cable runs. If the resistance is excessively high, several hundred ohms or greater, further investigation is necessary. If you have an assistant, they can watch the meter and you can bridge the alarm contacts of each sensor in turn with a piece of wire. By a process of elimination, this will enable you to identify the problematic sensor. Alternatively, you can go to each sensor in turn with the meter and measure the resistance across the alarm contacts. Remember that the loop must be disconnected from the panel, otherwise voltage will be present on the contacts, giving a false reading. Also PIRs and other sensors requiring power must be powered up for the contacts to operate. PIR sensors are triggered by movement of humans walking perpendicular to the sensor through its sensitive zones. If a sensor is mounted outdoors, it can also be triggered by cats or other large animals. Sensors are available which are only sensitive to human movement. If a sensor is located in a shed/garage, it can be triggered by bats, birds or rodents which have made their way into the building. Another cause of nuisance triggering is a badly placed PIR which points at a stove or radiator and picks up movement of warm air. 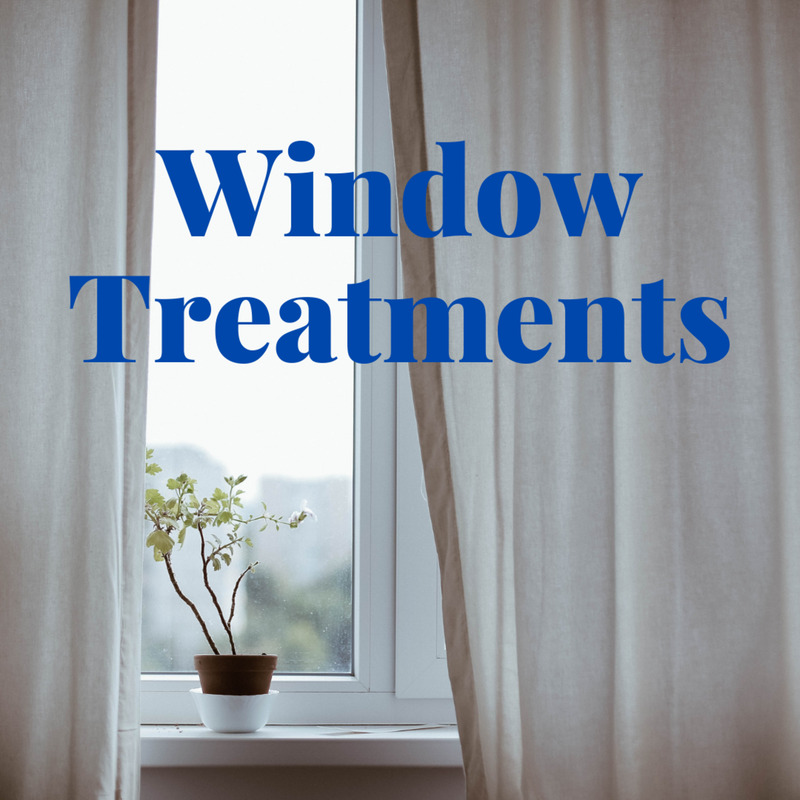 It is also not recommended facing a sensor towards a window to avoid picking up variations in heat caused by the sun. Sensors can't "see" through glass and have dual element sensors to make them insensitive to overall changes in sunshine level. I'm speculating here, but large changes in IR intensity caused by cloud movement could trigger a sensor if it faces out a window. Sensors should be placed so that intruders are likely to walk perpendicular to the device, through the sensitive zones. Also the sensor should be mounted in a suitable position in a room, at an appropriate height on a wall and angled in such a way that intruders cannot crouch down and pass through a blind zone (i.e low and close to the sensor). See diagram below. Instructions provided with sensors normally provide diagrams outlining the regions of sensitivity. Loose connections are always a cause of problems with any electrical or electronic device. When installing sensors, screws should be screwed down tightly on the cores of alarm cable, and ideally boot lace ferrules should be used to keep the strands of wires together. Ferrules are crimped onto the ends of wire and prevent the fine strands of wire of from being damaged by screws of terminals. They also make it easier to remove and replace wires from terminals, and have a shroud to prevent inadvertent contact between loose strands of wire and adjacent terminals. Connections can also become corroded over time, especially in damp environments. This type of sensor can be subject to false alarms caused by hailstones hitting windows, or more likely skylights, birds seeing their reflections and banging on glass or even impact of heavy traffic on roads close to exterior walls. There may be a setting inside the sensor to reduce the sensitivity. Also the number of impacts required to trigger an alarm can usually be set and this may need to be increased. Over time, the resistance of microswitches in sensors can increase. Ideally the resistance of a closed switch should be zero ohms, but this can become higher as switches age. If doors and windows are rarely opened, the reed switches in magnetic contact sensors can become "sticky" and fail to open, preventing the alarm from activating if an intruder breaks in. Another possibility is that the magnet can become weak, failing to keep the contact closed, especially if it wasn't placed close enough during installation. This can cause nuisance triggering, when e.g. vibration from wind or heavy nearby traffic is sufficient to shake the contact open. 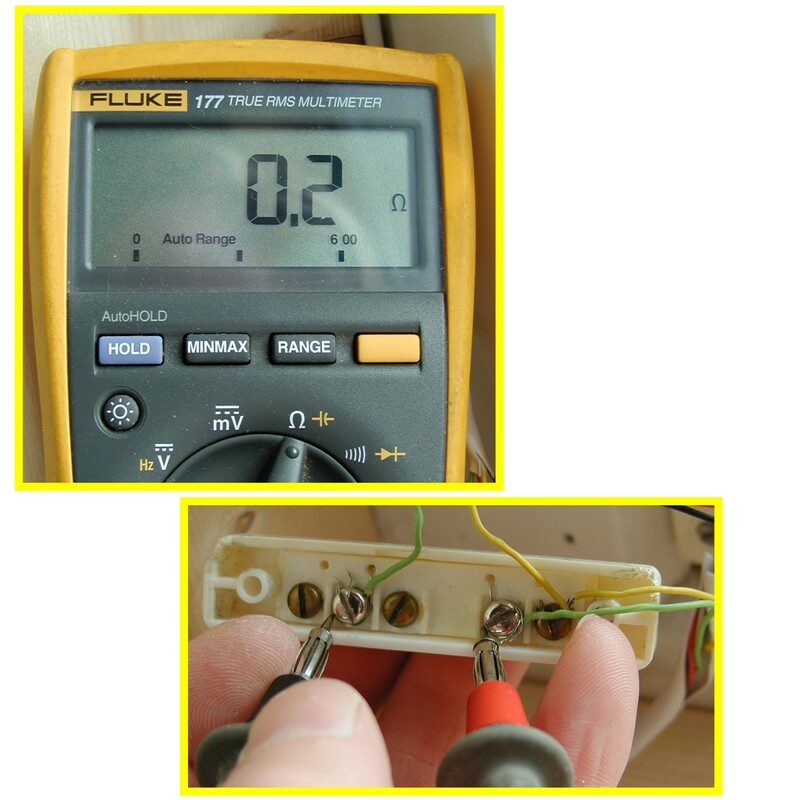 To check the resistance, set your DMM to the ohms range and measure resistance between the screw terminals. 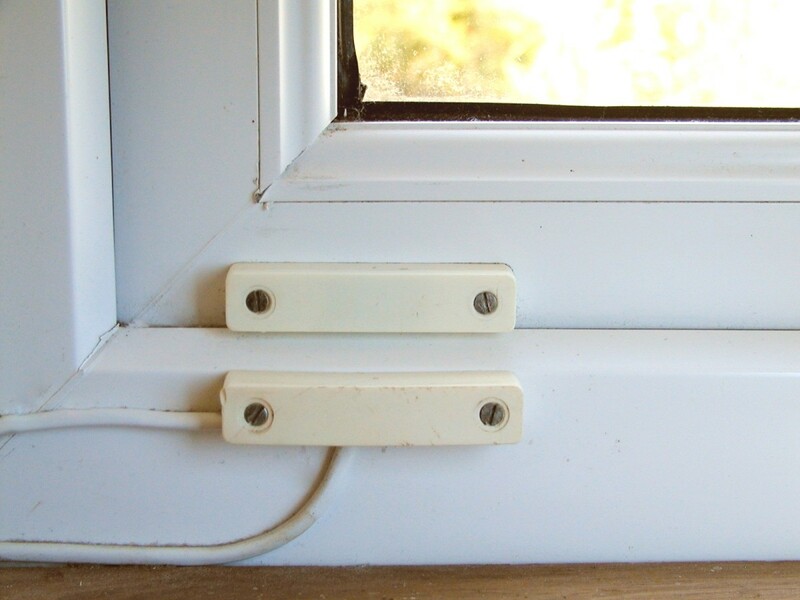 The loop should be disconnected at the alarm panel to remove voltage from the terminals, and of course in the case of magnetic contacts, the magnet on the window or door should be adjacent to the contacts to keep the reed switch closed. Tamper switches consisting of a spring operating a microswitch are used to detect someone removing the lid of a sensor or other components of an alarm system. An alternate style of switch consists of springy, nickel coated metal strips, pushed together when a lid is in place. These strips can tarnish over time, contributing to an increase in the loop resistance. This can produce false alarms as contacts expand and contract, and move relative to each other during hot or cold weather. Contacts can be cleaned with a piece of fine wire / steel wool and then wiped with rubbing alcohol / IPA (Isopropyl Alcohol). Don't overdo it because the coating (It's either nickel or chrome) could be removed. Sometimes sensors have tamper microswitches that are closed by a projection on the lid (often a small round piece of rubber) of the sensor when it is replaced. It can happen with badly made sensors that the rubber piece on the lid gets squashed over time and loses its springiness, so it doesn't put enough pressure on the microswitch. The symptoms are a sensor that generates a tamper when knocked (and possibly may do so if there is nearby heavy traffic causing vibration). 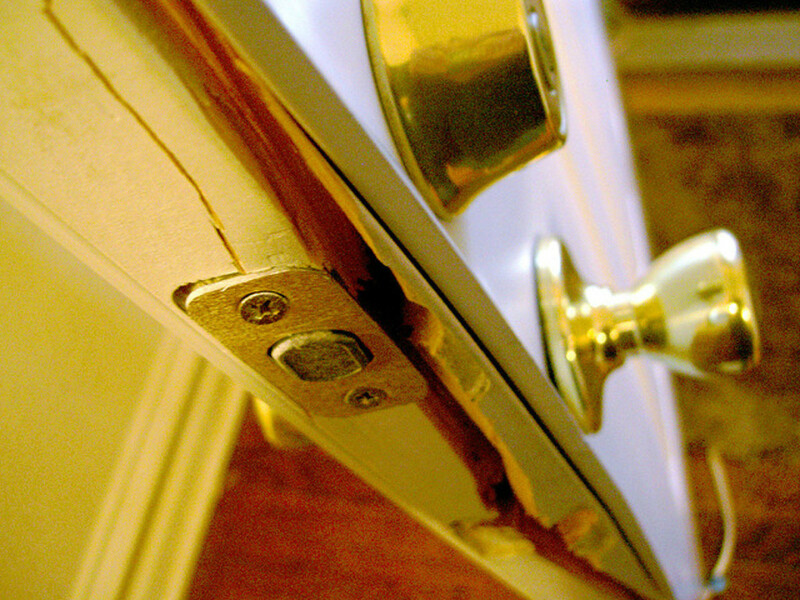 Alarm panel lids can also cause tamper faults, so check they are seated properly when replacing. Voltage spikes on your mains supply are caused by disturbances such as heavy loads being switched on and off in the locality, generators coming on and going off line, switching activity in substations and lightning strikes. These spikes can trigger false alarms. Your alarm is likely to be powered directly via a cable from the electrical panel in your home or via a spur from a cable via a fused connection unit. A surge filter may give some protection from false alarms caused by spikes injected into the power supply of the alarm panel. A lead acid or NiMh battery is used to keep an alarm alive in the event of power failure due to an interruption of your supply or deliberate cutting of power by an intruder. These batteries have a limited lifespan of 3 to 5 years. As a battery ages, its voltage can fluctuate, injecting noise spikes into the system. When a battery nears the end of its life, its capacity decreases and the length of time it can maintain backup decreases. If wiring is run adjacent to power cables, voltage spikes can be coupled directly into the alarm cables. 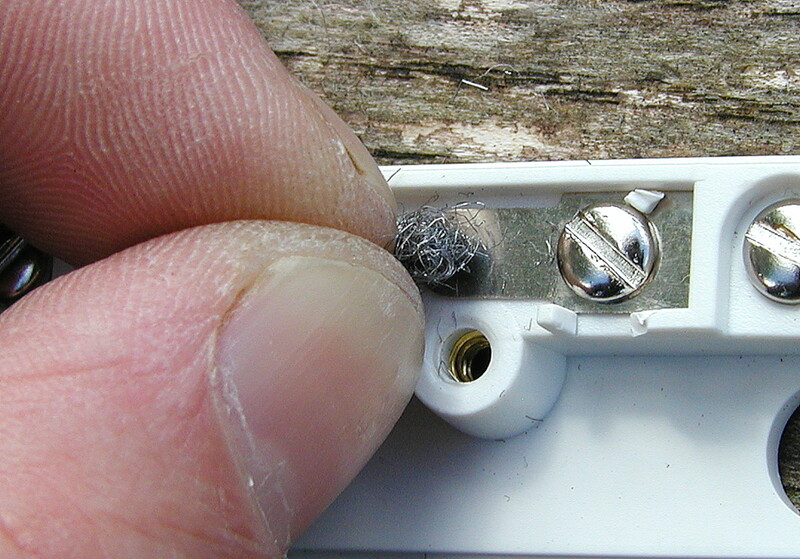 During installation, staples or clips may have cut through alarm cable. This can cause problems later as cores get shorted out. Also if you have had workers in your home doing renovations, make sure they haven't dislodged or damaged sensors, cables etc. How Often Should Burglar Alarms Be Serviced? Generally once a year. However if you get a discount on your home insurance, there may be further stipulations, so check your policy. Did You Fix Your Alarm Using the Info in This Article? I recently terminated my land line. Now my burglar alarm shows a problem with the phone lines. How do I bypass my burglar alarm? If you can find a programming guide for your alarm, you may be able to disable monitoring for a phone line in the settings. There shouldn't be an issue and most sounders run on 12 volts. 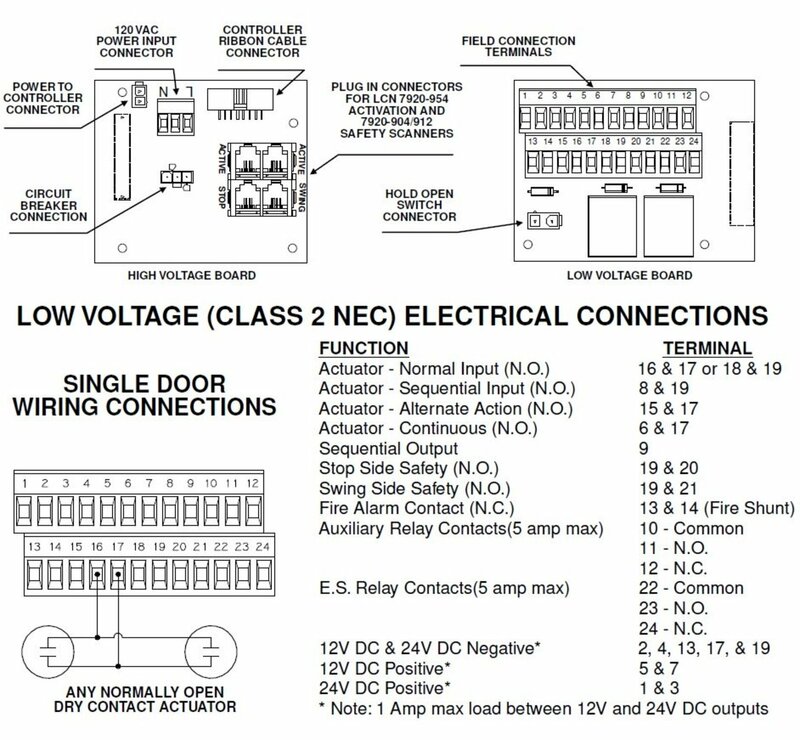 Connections can be slightly different between panel and sounder, but often a wiring diagram comes with the sounder showing how it should be connected to different panels. The people on the UK security installers forum were very helpful, knowing more about the details of different systems than I do and I got advice from them on how to connect my new sounder a couple of years ago. My keypads are displaying each zone starting with zone 1, zone 2, zone 3, etc. in a continuous loop, even though no batteries are low. It is just continually cycling through, displaying each zone. Do you know what caused this? I turned off the power, and it took a few hours, but the same thing started up again. Sounds as if the alarm is in some form of polling mode, checking all the zones. Sorry, I don't know what could be causing this, so it's best to call an alarm service technician to resolve the problem. I have a wired door sensor that stopped working but allowed the alarm to be armed without bypassing a zone. How is this possible? Sounds as though it has failed and the contacts are staying closed. If it's faulty with the contacts stuck open, then it would prevent the system from being armed. This morning my Honeywell Accent G4 alarm went off but read no faults on the keypad, so I had to get out my ladders and disconnect the battery in the siren, the battery in the main panel and pull the fuse. On closer inspection of the panel the only normal resistor has burnt out, all others are resistors. Any idea why this resistor would have burnt out? Sounds like there was a short somewhere on the board. Logic circuitry/the microcontroller on a board will work on 5 or 3 volts, powered by a voltage regulator. Wired sensors run on 12 volts, again sourced by a voltage regulator which would probably source 1 or 2 amps. The resistor here seems to be in the power /supply battery section. If the resistor has burnt out, chances are some of the other electronics became faulty and caused this to happen, so even if you replace it, the it may blow again. I got message code 403 'Kitchen open' on my alarm panel. The PIR sensor also keeps flicking. Also, when I try to set the alarm, it will not set as the code message appears. Can you guide me on how to fix this? You need to source the manual for the specific brand of control panel to see what the "403" code refers to. If the sensor is activating, it could be due to faulty wiring/loose connections, or a faulty sensor if there was no problem previously. Another possibility is a low battery if the system is wireless, but it should tell you this. The alarm went off and the keypad was completely dead. It stopped after about 10 minutes and the pad and all the sensors are dead, but the input light is on at the power supply. Is it a fuse problem or what? If there are any LED indicators on the sensors/keypad and they aren't lit up, it sounds like a fuse could be blown, or the power supply feeding the sensors may be faulty. Spring switch appears to be operating ok. How do you get rid of a tamper lid fault? If the system is wired and you have a single tamper loop, the fault could occur at any of the sensors or junction boxes on the loop or the sounder. If there's an individual tamper for each zone, this narrows things down. Check the spring is being pushed down entirely and isn't being pushed awkwardly off to one side when the lid closes. Check wires are pushed fully into terminals and they are screwed down tight. Junction boxes usually have springy metal contacts that implement the tamper. A piece of plastic on the lid pushes the contacts together when the lid is replaced. Make sure there are no wires in the way preventing the lid from sitting properly on the box. If your alarm identifies which sensor is causing the problem and you have a multimeter, you can remove the tamper wires from the screw terminals and check that the meter indicates continuity when the switch is closed. For a wireless alarm, again make sure the lid is sitting properly when replaced and also that batteries in the sensor/sensors are ok. The external bell on my alarm is not working, but the internal one is. How do you fix the external bell? It could be a fault with the wiring going to the bell if it's wired. However, it's more likely to be due to a fault in the bell (possibly caused by moisture ingress). If the bell is wireless and solar powered, there could be an issue with the battery/charging circuitry. As soon as I enter my house, the alarm goes off; there's no time to disable it. Why does this happen? The settings may have become corrupted on the alarm. Usually these are set in engineer mode on the panel. Consult the manual for the panel to see what codes you have to enter to change the entry time, and also set the zone for the external door as a walk through zone if necessary. My alarm went off and now shows that something is wrong in zone 3, the main level of my home. I opened all the windows and reclosed them, but can not get the alarm to come back on. Ay suggestions? If it's a wireless alarm, it could be that the batteries are flat in one of the sensors. However, your panel should tell you this. Any recent renovations could also have upset the wiring. If tampering occurred (possibly due to a nosy transient), you might have to reset the alarm. Hi I have an SI compact alarm in the house and for no apparent reason the attack led is lit and nothing is responding on the keypad. Any ideas how to resolve this problem without having to call someone out? Some large style panic buttons need to be manually returned to the un-pushed-in state with a key. Check whether you have one of these in the house and if so reset it. If you have any other type of panic device, it may need to be reset before resetting the panel. I'm not sure whether this is the model of your alarm, but if it has inadvertently gone into alarm test mode (the attack led blinks when it is in this mode), pressing reset twice exits test mode and program mode. Hi, an alarm sensor in my dining room was noisy. It sounded like dial-up internet, so I removed the front box and pulled the red wire out. I'm guessing it was the power wire. Is this dangerous? It sounds odd. PIR sensors have a relay, which clicks when it opens/closes, but if the electronics have gone wonky, it could be switching on and off rapidly, producing a buzzing or whining sound. Sensors are normally powered by six core cable, one pair for 12 volts power, one pair for the alarm contacts and the remaining pair for tamper. However, this cable is light gauge. If you're referring to the connection box for the alarm panel, this will be fed by mains power, the colours for mains/hot depending on your country. The red may be power if it's an old installation in the UK (old power cable cores were red and black for live and neutral respectively). 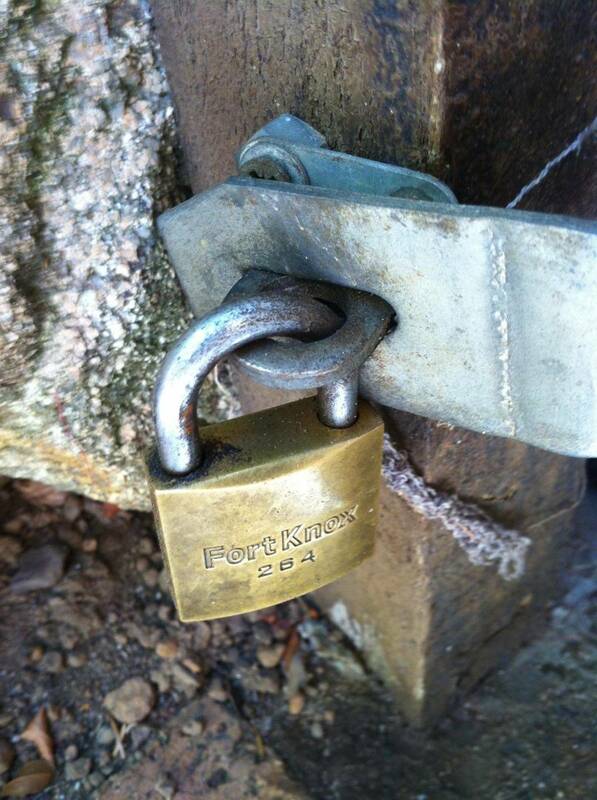 Might be a good idea to get an alarm installer or electrician to check it out. Can I disconnect a door sensor on my burglar alarm system? You can exclude it when arming your alarm. If it's an external door, you won't, of course, get an audible countdown warning when you enter through that doorway. You can also bypass the sensor by using a wire link across the contacts. We have reed switches at the doors, what is the possibility of hot or cold temperatures to cause them to make a false alarm? Possibly expansion and contraction of the tiny metal strips in the reeds as the temperature changes could cause false alarms. Another possibility is that the magnet and switch are too far apart. Usually, the gap shouldn't be more than 1cm or whatever the manufacturers recommend. If the gap is too great, the switch may be only barely held closed and any temperature changes or vibration could shake it open. The reed may also be faulty or low quality. I've had to replace lots of contacts, mostly on windows that were only rarely opened. So they seem to "stick" if not "exercised"
My PIR is showing active all the time and I cannot activate my alarm. What can I do? If the PIR is wired, it could be due to loss of voltage caused by a blown fuse, loose connection or broken wire. On a wireless system, the battery may simply be flat although I would think your panel should indicate this. I only have six sensors installed on my burglar alarm, but tonight a seventh sensor went off three times. I don’t know what triggered it, or where the seventh sensor came from. In the end, I deleted that sensor. How is the alarm doing that? It could be a shorting at the panel link on that zone is loose. What is causing my PIR sensors to malfunction? A blown fuse could possibly be the cause of your problem (it could be marked "auxiliary"), or loose connections, cut or broken wires, shorted wires on a loop, upstream of the sensors (the panel side) or flat batteries on wireless systems. I have an ADEMCO Vista 10SE system. The monitor service has been terminated for several years. Recently I armed the system, but opening the door won't trigger the alarm. When I tested the door, I can hear a chime. The keypad shows a low battery. Could this be the reason why I can't set up the alarm? Sensors can be temperamental and get stuck sometimes. Try tapping the door sensor if it doesn't trigger the alarm to see if this is the case. This is the manual just in case you haven't got it. I have an optima g4 alarm and have zone 1 set on a chime for entry-exit. Just recently the alarm will chime on zone 1 even when the door hasn’t opened. Also during the night for some reason when the alarm is armed, zone 1 will activate when the door hasn’t been opened beginning the countdown for the panel to go into alarm mode. Do you have any ideas? I can't answer questions on specific models because there's just so many variations, however in general, this could be an issue with the sensor magnet becoming weak on the door, a faulty sensor on the door frame, loose connections in wiring, low batteries if the alarm is wireless and an aging backup battery in the control panel. Probably best to get a service technician to check out the system and possibly replace the sensor. I have a Scorpion Z6 alarm installed 2000. I want to repaint the bell housing which is rusted. How do I turn off the tamper alarm to remove the cover? I can't find a manual for this specific alarm, but if I'm doing any maintenance on my bell or panel, I tie up the tamper spring. This spring usually makes contact with the cover of the bell and pushes against a microswitch on the PCB and keeps it closed. I use a piece of wire or string and tie it to any convenient hole, projecting a piece of plastic or similar in the housing. Sometimes I use a crocodile clip or clothes peg and clip this onto an edge and tie the wire to this. When the alarm is activated (e.g., Overnight), a downstairs PIR sensor goes into alarm when I am walking in the room above, as if it is affected by vibrations. This just started a few days ago. Any thoughts as to why and where I should start looking at the issue? It does sound as though there could be an issue with loose connections in the sensor, wiring, junction boxes, etc. Is the sensor wired and definitely on its zone, and not looped in series with window contacts or shock sensors? Contacts can go open circuit if the magnet is mounted too far away or has gone weak or the reed switch is faulty, and there's vibration. I would try covering the sensor with something to shield it so that it doesn't pick up body heat (e.g., a piece of card taped on). Then try tapping the case of the sensor to see if it triggers. 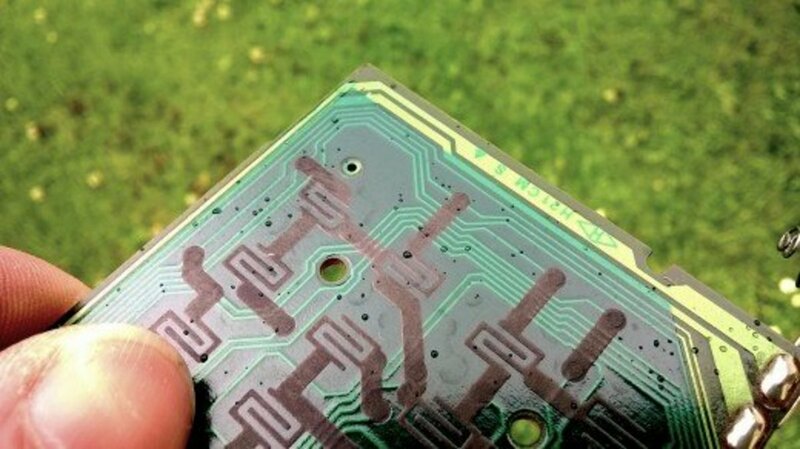 The tamper switch on the PCB may not be held tightly closed with the cover in place. I had an issue like this with my system and tapping the PIR triggered an alarm. It turned out that the little piece of rubber on the front part of the sensor didn't push tightly down on the microswitch with the front replaced. I have a hard-wired alarm system with a Napco RP1054e keypad. It has been working fine for over 18 years. The other day, the alarm keypad alarm was sounding, while showing a code 11 on the screen. I was able to get the alarm to stop but now the code is 8, and I can't activate the alarm. Any idea how I can fix this? This is the manual for the pad. Unfortunately there doesn't seem to be any info on status messages. When I key my code into the keypad and leave the house by the front door, the alarm sounds for 20 seconds and then turns off. But now, the alarm goes off indefinitely. Once I open the door to enter the house, the alarm goes off, and I can turn it off as usual. What is the problem? Where is the 12V battery? The 12-volt battery should be in an alarm panel box where the wires from all the zones feed into, or in a combined keypad/alarm panel. If the exit tone goes off indefinitely, that means the contact on the door may be working intermittently and should be replaced. My house alarm keeps sounding the internal sounder, and it happens every day. We have checked the spring, and it seems to be working fine, so I don't know what to do. My alarm is a C&K Securitech 800L. Do you know what I can do? If it is just the internal sounder, the chances are that it's a tampering problem. (This should be indicated on the display, or an LED will indicate either a "24 hr" or "tamper"). A tamper fault can be caused by loose connections in sensors, voltage spikes on power lines or bad connections in junction boxes. These sometimes have springy metal strips that are closed when the lid is replaced. Resolving the problem is basically a process of elimination, making one change at a time and seeing if stops the fault occurring. I need to remove the tamper switch. How do I hard wire the 4 contacts once the tamper switch is removed? Check for any loose connections, moisture and tarnishing on the battery contacts (clean with wire wool). Check your battery with a battery tester, or better still replace. Usually these devices work on an inexpensive 12 volt battery (CR23A or similar). It depends entirely on the model of the alarm. Most alarm manuals are available online, so if you can source that, it's probably just a matter of changing a setting. Not sure what you mean, but this is the manual for the alarm. I will have a look for possible physical damage to the cable. Thanks again for your explanation! Something along the line must be causing an increase in resistance. Since the new cable works fine, it obviously wasn't current load that was causing the drop, but resistance. Sometimes bad connections or corrosion can cause problems at the point where wires are wrapped under the heads of screws in a terminal, but you checked that. Maybe something sheared the cable under the ground? (Something heavy driving over it, building work, spades used during gardening) so that two ends of a broken core were just sitting in soil or even water in the conduit. You would still measure 12 volts with no load (a multimeter has an impedance of 10 mega ohm), but because of the gap and resistance, current flowing to a sensor would cause a drop. Could mice have gotten into the conduit and bitten through the cable, or is it only narrow gauge conduit? I've now traced and excavated a 6core cable and used of the 2 cores to supply 12V to the 40m point. My beams now all have a healthy 12V supply and its all working again. I don't understand how my 1st run of cable, in conduits along with all the rest, laid and buried in 2005 has now developed a fault where it carries 12V ok, but then the voltage drops as soon as there is any tiny load on it. There has been no movement or activity where these conduits run, ie nothing to affect it? I wonder what type of fault in a cable can manifest itself like this? With all the devices (ie beams) disconnected on the 1mm cable, the voltage shows as 12V at the 1st point (40m). If I connect the cable (no devices just the cable run to the very end 100m) it shows 12V at each device location along the way. If I then connect a device at the 40m point it drops to 6V. At my panel I disconnected from the 'Aux out' and connected to a 12V battery, same result 6V 40m away at the 1st device. I tried a different device (brand new beam), still drops to 6V. I now test on an existing 6core alarm cable along the same run to the 40m point, with new device connected it's showing 12V. I then connect this 6core back to panel Aux, at the 40m point it still showing 12V. This seems to suggest to me that the 1mm cable maybe causing the issue? That's 0.197 amps in total so even at 100m, voltage drop should only work out at 0.68 volts, based on that calculator. You could use other ones to confirm it's correct. Yes, the thicker cable looks like just over 1mm diam. 3 x trans@ 27mA max, 2 x receivers @ 58mA max. Edit. My calculation for 0.22 square mm cable was wrong. Voltage drop is 15.6 volts per 100m per amp. By 1mm cable you mean 1 square mm CSA, diameter is 1.13 mm using the formula for area of a circle. Putting this into the calculator gives a drop of 3.43 volts per amp per 100m. ... current capacity is 1A for 0.22 square mm. If cables are enclosed in insulation, the derating factor (for mains anyway) is 0.5, which means cables can only carry half that current. You could check the current requirement for your sensors from the spec, and see whether it falls within this rating. I would think the beams would need more power than the receivers, but the latter probably wouldn't need more than tens of mA. You could use your meter to measure the current. I just checked this voltage drop calculator. For 0.22 square mm CSA cable (I worked out the diameter from this), voltage drop is 17.5 volts per amp over 100m. So on second thoughts unless the sensors are using very little current, it mightn't be a good idea to use the alarm cores. I didn't realise it was this high. It might explain why my alarm goes off so often in my workshop because of all the shock sensors and PIRs. All the small current demands add up to give something substantial. I've also got 6 core alarm cable running alongside the 2core power cable (to the receiver units anyway). Would I expect a voltage drop on standard alarm cable over this distance? ie. I could use a spare pair on the 6 core to carry the 12V to these beams? Hi, thanks for the speedy reply. Today, going against logic I fitted a new battery, and of course you are correct the battery isn't the problem! Today I traced the cable (it's twin core 1mm to avoid voltage drop over the distance), it's in conduit buried, total approx 100m and carries the power from the panel to 3 sets of beams along the way. At the panel it is reading 12V on my meter, the cable appears to be intact/undamaged and I've checked the connections. Having just read your post I've disconnected each sensor and taped the cable ends, and at the 1st junction (1st beam unit) it is now reading just 6V. There's no rust or poor connections I can see. I'm thinking my next step would be to run a length of new cable overground to the 1st junction and see if that can show 12V at 50m from the panel? ...Regarding the answer below, another possibility is that one of the sensors is faulty, pulling excessive current. This may cause a voltage drop along the 100m of cable because it is light gauge. Voltage drop equals current x resistance of conductor. The fact that the battery could be "tired" or aged shouldn't affect the auxiliary output voltage. A 12 volt regulator normally produces the auxiliary output and this is driven by a DC power supply powered by mains. If voltage is only 9 volts at the sensor, 3 volts is being dropped somewhere, possibly due to corroded screw terminals somewhere along the line. If the sensors were loading the auxiliary supply, voltage would also be low at the panel. Check the first sensor in the line closest to the panel and if voltage is low, a drop is occurring somewhere upstream between the sensor and panel. I have a Veritas 8 panel alarm which includes 4 pairs of outdoor Aleph IR beams, furthest distance IR beam is located 100m from panel/PSU. System has worked great for 8 years. I'm now seeing false alarms from 2 of the IR beam pairs. On investigation, I discover that the voltage at the sensor is only 9V, and at the panel Aux is 12v. If the panel battery was 'tired', would this reduce the amps available to drive the detectors on the system, and therefore a lower voltage at the extremities of the system? Also, could I add a separate 12V PSU and connect it to the circuit (ie would it harm the Veritas 8 panel?). Many thanks! It sounds like a faulty sensor. The magnet may have weakened over time or it could have been placed too far from the sensor originally. 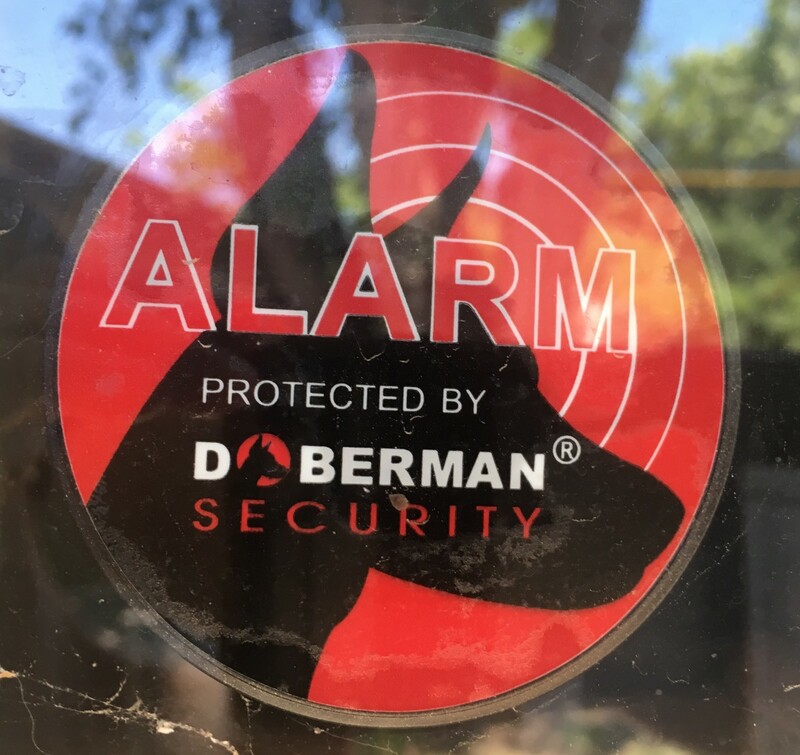 If your alarm system gives an audible indication of which zones are still open, you can try going to each sensor and holding a magnet against it to see whether the additional magnetic field closes it. Alternatively try tapping each sensor to see whether it closes. By a process of elimination, this may help you identify the faulty one. If components have burned out, it's probably best to replace the whole unit because other components could have failed also and it wouldn't be worth the effort of troubleshooting. Also I found that the lacquer coating on the PCB of my bell had broken down over time due to the high voltages involved (several hundred volts) and moisture, causing tracks and components to fail due to arcing. Boards with LED strobes aren't prone to this problem, although the strobe isn't as bright as a xenon tube. I doubt whether hitting the bell box would have done any damage unless the poles actually penetrated the box, or shook something loose from the PCB which shorted out components. This morning my Honeywell Accent G4 alarm went off but read no faults on the keypad, so I had to get out my ladders and disconnect the battery in the siren (is a RESON8 Bell Box, 8EP420). On closer inspection of the siren electronics I have a resistor burnt out, the Strobe tube has burnt out too. This happened after the builders dismantle the scaffolding, it could be due to them hitting the bell box while moving the scaffolding? Put my Accenta 8 mini in engineer mode (prog 9999) removed cover on pir then replaced pressed set to restore instead reset now keypad has locked out. Do I need to power down to restore the system. Our control panel just shows a series of black blocks, and does not respond to any entries made. It is a GARDTEC unit. There is some reference to an engineers code on the internet, I don't have that, but I know the password to set/unset the system. Do you recognise this fault and know what this might be? Have you tried to disarm it several times using the password? Possibly the keypad is giving trouble? It may be possible to reset the alarm by removing the cover and shorting out reset contacts. However the alarm will have to be reprogrammed with all settings again. My alarm is armed and I cant disarm it. It could be the sensor, connections or even just transients on the line which are the most frustrating to troubleshoot because they are infrequent events, caused by a spike in voltage on adjacent mains cable or on the mains power supplying the alarm panel. You could try shorting the wires connected to the contacts in the sensor and see if it eliminates the problem which would indicate an issue with the sensor. If the sensor is the last in the line on a zone, it may have an EOL resistor as explained in the article. I have a Ademco Vista-20P security system and lately when I am gone for a length of time I come home to find a "ALARM 08 LIVING ROOM MOTION" message. Clearly this indicates a failure of the one motion sensor but I do not know what to do about it? The system is 15 years old and this is the first issue I've had (other than replacing the battery twice). Has the motion sensor failed?, Is it a corroded or dirty connector? BTW, obviously based on its age this is a hardwired system. When I walk past the passive infrared motion sensor the red light comes on right away. And I removed the snap on cover and other than the mini circuit board I do not see a backup battery or anything. It is a large egg-shaped sensor and inside on a sticker it says "Aurora K3380V1 Listed Intrusion Detection Unit 885M". (But stamped into the inside of the plastic cover it also says "K3300V1 M6753"). Any advice? Try sending me a Facebook message. Follow the link on my profile. I have took a photo but I can't seem to send it to you via your profile as it won't let me add attachments. Please advise. Can you take a photo and send it to me via my profile? The model is an ITEC Meridian the sensors in question are as far as I know are the same company. Plain cover with barrel shape sensors. I would be very grateful for you help. Hi Ricky. Do you have any model information so I can look it up or maybe get an installation guide? Can you please tell me what the N - D markings mean on the end of the barrel shaped shock sensor please. If they are for orientation purposes then what direction should they face please. Hi Harry. The only thing I can suggest is to remove any covers and check to make sure that no wires have come loose or have broken. If the sensors have a tamper switch kept closed by the cover, check this is being pushed down properly and the covers are seating ok.
You can view it online or download it as a PDF and read with Acrobat Reader which tends to be easier. According to the info on page 12, the yellow ;ights indicates a problem, and the number of beeps plus the zone light illuminated tells you what it is. On page 6, it seems to say you can acknowledge and ignore the problem and arm the alarm. This is the programming manual. I'm not sure which option is for disabling monitoring of the phone line for disconnection or inability to report to a central station, possibly System Feature 26 - "Inhibit Failure to Communicate". (page As far as I can make out, you press # and the feature number, in this case #26 and then Key 3 to toggle this on. The problem is that if you start fiddling with the alarm and get it wrong. You might end up screwing it up and not being able to arm it. So it might be better to source a servicing company. My security company went out of business and we never reestablished a service contract with another provider. It's been over a year now, and now my home alarm system has a yellow communication warning alarm. I can enter a code to turn the alarm off, but I always have a yellow warning L.E.D. light on my front keypad. I'm assuming the system thinks someone has cut my pone line so it generates the code. Question? Does an alarm system have to be re-programed with phone service disabled in order for me to continue to use my system for all the sensors, even if I don't use a service provider? You may be able to acknowledge the event and prevent further notifications. Exiting/entering the house isn't an alarm condition though unless the entry/exit time is exceed and the alarm is triggered. So you need to edit the setup to eliminate the notifications or get your alarm company to do so. Just loop the contacts of the magnetic contact sensors and PIRs in series. Use an EOL resistor at the end of the loop if the panel requires it and resistors across each sensor if the alarm is a FSL system. Hi, is it possible to connect contact sensors and a PIR using the same cable for the same zone? Hi Dave, on some alarms, entering the alarm code turns off the alarm plus you may have to press a further key/keys to reset it. Do you have a user manual for the alarm? HI, I tried to open the cover on the alarm panel of my honeywell alarm and the alarm sounded. I turned it off by entering my code but now I'm locked out of the system with the spanner light flashing? there's obviously a sensor inside, how do i reset it? It could be, but check that any fuses are ok. These are often 20mm, 1A glass types. Replace fuses only with the same type. Hi,I have a hkc outside bell box that is not going off in an alarm situation so I replaced it with a new one and have the same problem.I have checked all cables but found that back at the control panel there is no voltage at the external bell terminals.could the PCB be faulty??? Voltage is usually 12 volts to sensors/contacts, so not a hazard, but to be doubly sure there isn't a mains electrical wire putting dangerous voltages on the wiring, you can always check with a neon phase tester screwdriver. The issue could be due to a loose wire. It can also be caused by a faulty contact, but sometimes the magnet can lose strength and not keep the contact closed anymore, especially if the magnet wasn't mounted close enough to the contact in the first place. Contact/magnet spacing should be 1 cm at the most. You could try moving the magnet closer (maybe put some sort of spacer underneath) and see if it improves matters. Hi, There appears to be an issue with the front door magnetic sensor. The door is closed but we are hearing a "beep" as though the door has opened. This then sets off the house alarm. I tried to move the wire by the sensor the beep occurs. Could this just be a loose wire? is there much voltage within the sensors so that I know its safe to check myself? Haven't been able to find any info on the Abacus panel, but try http://www.thesecurityinstaller.co.uk/community/ and they might be able to help. I'll see if I can find any reference to the error and get back to you tomorrow. I have an Abacus LCD alarm panel and all of a sudden its started playing up a little. Its fine until the alarm is set and then as soon as its armed it will sound after around a minute every time, the log shows the reason for the alarm to trigger as "KP1 Engnr". Any clues what could be causing it? I've already tested the battery in the main box and the voltage is constant and fine. Any helps appreciated, very nice of you to help all these people through your site. The Veritas R8 is not wireless unless a module has been added to make it so. A sensor that acts up could be faulty, require a battery if it's wireless, or the wiring has developed a fault somewhere along the line, perhaps due to renovations. Motion sensors can also be triggered by sudden changes in temperature e.g. if they face a window or radiator. I have Veritas R8 from Texecom . I think it is wireless. one of the motion detectors kept alarming unnecessarily on/off! Is this a wireless system? The battery may need replacement in the keypad. If the system is wired, and this is a remote auxiliary keypad, again there could be a flat battery in the pad. If the keypad is wired and separate to the main alarm panel, connection box, trace the wiring and see if the panel/box is feeding the keypad with 12 volts. There may be a fuse blown in the panel, so check that first. Normally external sirens won't activate unless the system is armed and you start opening sensors, the panel, junction boxes etc. However if you do the same when the system is unarmed, a sounder will normally activate on the panel to indicate that tamper loops have gone open circuit. Whenever I'm working on my panel and this happens, I just enter the code to silence the sounder. The external siren will operate if the wiring for a panic switch goes o/c, or the cover is opened, irrespective of whether the system is armed or not, so you may want to have a wire link ready to short out the contacts until you're ready to replace the cover on the switch if it's a wired type. I'm not sure about engineer mode on your panel. Usually there's a time period during which work can be done before any sounders operate, but even if that happens, I'm sure you can just exit and re-enter engineer's mode to reset this period. Hi, I need to change my magnetic door contactor, a vibration sensor and panic alarm switch. Thanks to internet info, I have managed to sus the engineers code for our Paragon Plus alarm; hence, once the system is in Engineers Mode, can I do the work without triggering the sirens? Hi Jayne, If you knew the model of the alarm, it may be possible to source a manual to see what the flashing LED means. You could try posting on this forum. There are lots of members who are installers and would be familiar with specific models of alarms. Hi my telstar alarm green light on the control panel and the main box is flashing and id like to fix it how do i go about doing that? The company is out of business so i have no one to ring. There's probably an issue with the battery being charged. Possibly a blown fuse, or a fault in the charging electronics. Check also mains power is going to the alarm. There may be an LED to indicate this on the panel (which may be a separate unit, or integrated with the keypad). ..but depending on your country, manufacturers may or may not give out technical information for security reasons unless you are a registered installer. Hi Eugene, I have a Gemini P1632 and I need to change a component in the motherboard. where do I find technical information about this ? There are several methods. You can try cleaning the conductive rubber pads under the buttons with IPA, but this only seems to work temporarily. 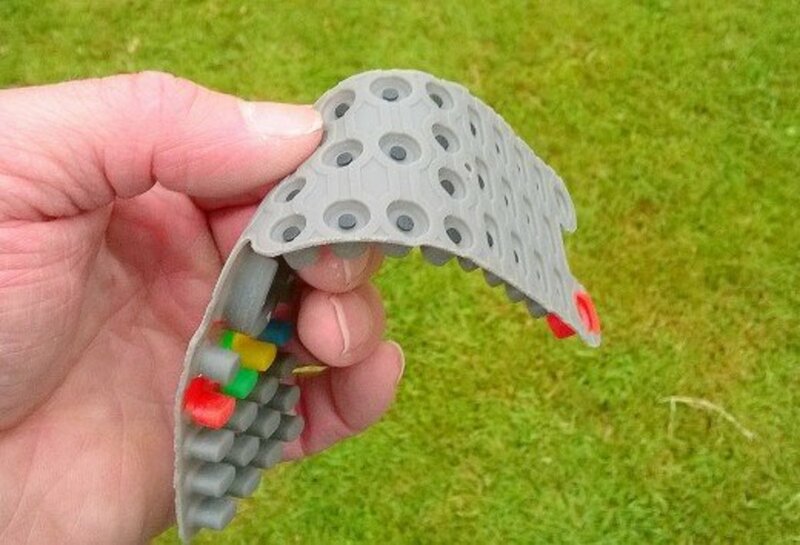 Another option is to buy replacement rubber pads and stick them on to the existing ones. Yet another solution is to cut out foil disks with a paper punch (as used for making holes in paper when putting it into a ring binder) and then stick this onto the pads. I did this with a keypad a few years ago and it's still working. i have a much used keypad and the top three numbers that were our code no longer make contact easily so we changed our code. is there a way of mending them without buying a new keypad? Is this a PIR sensor and is the alarm wired? If it's a wired alarm, I assume you've checked connections at the sensor to ensure they are tight, and similarly at the panel. Check also connections at any intermediate sensors in series on the loop. If there are any junction boxes in the zone, check these also. Has any home improvement work been carried out which may have damaged the cable, or could it have become fatigued over the years from flexing? Has electrical mains wiring been installed close to this zone's wiring? Could cable have been damaged by rodents? Do false alarms occur during the day or night and at any specific time and is there any pattern to the event? It could be an issue with the panel's PCB. Maybe a dry solder joint is acting up after after the connection has oxidised over the years. To eliminate a wiring continuity problem or something else triggering the sensor, I would bypass the zone by removing the contact cores from the screw terminals and add a shorting out link and see if this prevents false alarms. I'm not sure whether this is possible, but maybe electromagnetic interference from nearby high power radio transmissions could be inducing voltage in the cable. I know from experience that if mains cable runs close to alarm cable, unplugging appliances can trigger an alarm. The alarm shouldn't be set off when not armed and the contact on a zone opens. The only thing I can think of is that either the contact is wired incorrectly into the tamper circuit (in which case the tamper sounder would activate at the panel, but not the external sounder) or alternatively it's wired into the panic circuit, in which case it would set off the alarm and activate the external sounder (if there is one and the alarm isn't some form of monitored, silent type). I have door contact which sets the alarm off when you open door when the alarm is off. i hace replaced door contact and when you tryand set alarm the panal its saying open zone. I don't think the external battery if it's in a sounder, should cause a tamper indication. Maybe you have to clear or acknowledge the tamper before the tamper light goes out? Check all lids on junction boxes, sensors and panic buttons. Also check the tamper spring on the panel hasn't become dislodged/fallen out. Wonder if you can help. I've a veritas 8 alarm with a solid red tamper light. The tamper loop is already bridged on the circuit board & no zones appear if I do a prog19 test for faults. The internal battery was dead but has been replaced. Can the external battery that I'm assuming is dead too cause a solid red tamper? Thank you for your help. It was a failing sensor / weak magnet. I replaced the sensor and magnet and it works perfectly now. Bats, birds and possibly spiders can trigger PIR sensors, but if there's an LED on the box for each zone which indicates that an alarm occurred in the zone, it should light up. Try causing an alarm on the other zones and see if if the box indicates this. Then maybe it's a case that the indicator is at fault. However there is the secondary problem of what is triggering the alarm. Are there just LED indicators on the panel or an LCD display which gives more info? Does the alarm just consist of magnetic contacts on entry/exit doors and PIRs? Lots of things can trigger false alarms including loose connections in wiring, tamper contacts getting tarnished in junction boxes and moving when they expand and contract due to temperature changes (the sort of thing that can cause connection problems in a torch), over sensitive vibrations sensors triggered by hail stones on windows or heavy traffic, voltage spikes on lines etc. Possibly the software on the alarm has gone wonky requiring a reboot, but this is likely a job for the service technician. Is there a 'warranty' period for the service? I'm having a annoying problem where the alarm goes off 15 minutes or so after it's set, but no red lights show on the box to suggest what is setting it off? The alarm is about 10 years and was fully serviced, with the back battery replaced last summer. Any ideas why it's suddenly giving false alarms, could a spider etc trigger the PIR's but not the red lights? Sounds like a loose connection or possibly the magnet has weakened so it's ability to keep the reed switch contact closed is borderline. Sometimes contacts can stick closed, but it's possible that they can transiently open due to vibration if the magnet is barely keeping them closed. It's probably best to replace the contact, but before you do that, if possible, join the two contact wires together and leave for a period to see whether the zone is going o/c somewhere along the wiring. Great post however I am having a slight issue with my magnet door contacts that I couldn't find an answer too. When I open the door the zone shows open, when I close the door the zone shows closed. However about 2 seconds after I close the door the zone goes into open mode again and takes a couple minutes to go into close again. This is the only sensor on the zone. "My alarm has the tamper light on and wont work at all. Initially the alarm went off and my neighbour went in, and took one of the senser covers off. This didn't stop the ringing but the ringing stoped when she put the code in. We have put the cover back on but the alarm's not working. Also the alarm control box feels a bit warm on the top. Do I need an engineer? Thanks for any assistance you can give." A tamper indication means that the lid of a junction box, sensor, sounder/bell box cover, panic button button lid etc is loose. It could also be because of a loose wiring connection. Depending on the alarm, if the tamper activates, the strobe light (if there is a strobe light) on the sounder on the wall outside may activate. This requires extra power from the alarm panel which could explain the heating. It's probably best to call an engineer who would be experienced with this stuff and resolve the problem quickly. I presume by "pair" you mean PIR? Sensors don't necessarily have to giv an indication on movement, but usually they are set to do so. If the system is wired, it could be a problem with the voltage supply to the sensors. You would need to check this with a DMM (multimeter) at the sensors. It should be 12 volts. If it isn't, trace the wiring and check it's ok at the panel. I don't know why the indicator on one of the sensors goes from dull to bright. This could be normal, but also the sensor may be faulty. Is this sensor able to trigger an alarm? I have 4 pair sensors on my system, one is lit all the time and goes from dull to bright and the other 3 are not lighting on movement at all any ideas why this is happening. It sounds as though the sensors are dodgy. Usually sensors get stuck closed and the reed switch contacts don't open when a window/door is opened, but they can go faulty the other way and not close. If you don't have too many contact sensors, you could try bridging the contacts with a wire link, then wait and see if the problem is resolved. If it isn't, possibly there is an intermittent bad connection in the wiring/junction boxes and the loop goes open circuit when temperature rises falls. I have one zone on my windows that says its always open even though it isn't. Some times i can put magnets on the sensors and it fixes the situation for 24 hours then the zone says its open again. What is the solution for that? Bells/sounders often have an internal rechargeable battery to cater for the situation you describe, i.e. power is cutoff (by a burglar), or the cable to the bell is cut. Usually the backup battery in the alarm panel (or separate box if you have a remote keypad) keeps the panel alive plus provides a voltage signal to the bell if mains power is removed. However if the panel has no battery or the battery is defective, this voltage will drop to zero when mains is removed and this is likely what is triggering the alarm. If a panel has LED indicators, these are usually power, tamper (24 hour), panic (PA), and then an indicator for each zone, which light up if the zone isn't clear. Do you think it's one of these indicators which is lighting up for the kitchen zone? Is this the sensor you removed for painting? It's difficult to check anything without a meter. If you had one you could check continuity of the tamper loop by removing the pair of tamper wires at the panel, connecting the meter probes to the wires, then wiggling the wiring at the sensor you removed for painting to see if there's an intermittent break in the wiring. HI Eugene, thanks for the tips, since i posted the first comment (I posted the first comment but didn't show in my feed as I had not logged in) then i have been fiddling with it, hence the second post. Got all the pir's lighting up now, alarm pad is off tamper, i put a wire in the box looping both tamper connections (from another post). When i set the alarm now it shows a red light on the kitchen zone (fault?) I will check the wires again and if still showing a fault maybe buy a new pir as I dropped it yesterday too?? i don't have a voltage meter, thanks for your help. Check the reply I posted yesterday. If you disconnected any of the wires from the sensor you removed to do your painting, check they were put back into the correct locations in the terminal block of the PIR (have a look at the other PIRs or the control panel to see what colours are used for tamper, power and contacts). Also the tamper core in the cable feeding the sensor could a broken conductor. Are your other sensors showing an indication of movement now? In your original post, you said they weren't? HI Eugene, i took off a pir in the kitchen to paint and when i put back the alarm it says tamper. I have had a few of the other pir's off to check wiring but seem ok. I had a 1 amp fuse blow in the box but renewed this too. The alarm say tamper and all my pir are light up with movement. any ideas, much appreciated. its an accenta. cheers for the help. Check the wiring of the original PIR you removed to ensure there are no loose or broken wires in the tamper circuit. It sounds as if you've lost the 12 volt power to the sensors. Make sure there are no other fuses blown at the panel and use a multimeter to ensure that 12 volt is actually present on the terminals feeding the wiring for the PIRs. Then check whether 12 volt is present at the sensors. Also the original sensor could have blown the fuse again if there's any wires/strands of wires touching at its terminal block. Hopefully the 12 volt supply regulator hasn't blown on your panel, but if you can't measure a voltage, remove the positive power wire of the cable feeding the sensors (at the panel) and see if 12 volt is then present. If it is, a sensor/wiring may be pulling the power line low. The panel may have been reset to the default password which for a 4 digit password could be 0000, 1234 or similar. Does the panel say incorrect password or just not acecept input? Which model Abacus keypad do you have?